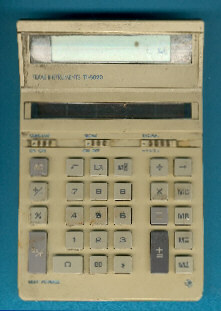 Size: 7.5" x 5.1" x 1.7"
The TI-5020 was introduced in 1983 and and got the then new grey-blue design. In the same timeframe a similar housing was used with the TI-5100 II. In 1988 the TI-5021 introduced a 12-digit display and included even a clock module. The TI-5022 sports a 12-digit display in an otherwise identical housing. The plastic material used for the housing of the TI-5020 is very sensitive to direct sun exposure. Find a picture of a heavily used calculator. 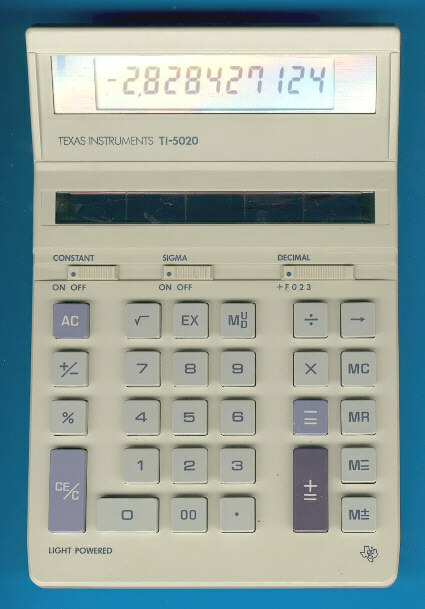 The TI-5020 is featured in the Texas Instruments Incorporated bulletin CL-823A dated 1985. © Joerg Woerner, December 7, 2002. No reprints without written permission.